With the loss of the ability to sync with macOS High Sierra and long GPS acquisition times, I figured it was finally time to replace my Garmin Forerunner 305. 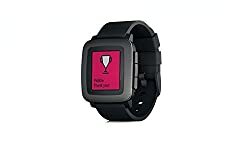 Since Fitbit is shutting down most Pebble services, I figured I might as well replace my Pebble Time as well. I settled on the Garmin Forerunner 35 as an inexpensive smartwatch and exercise GPS with heart rate monitoring. After two weeks with the Forerunner 35, I’m satisfied but not thrilled. It’s convenient going to a single device; however, it isn’t as good of a smartwatch or running GPS as the dedicated devices it replaces. This entry was posted in Miscelaneous, Pebble Time and tagged forerunner 35, gps, review on February 11, 2018 by Kenji Yoshino.